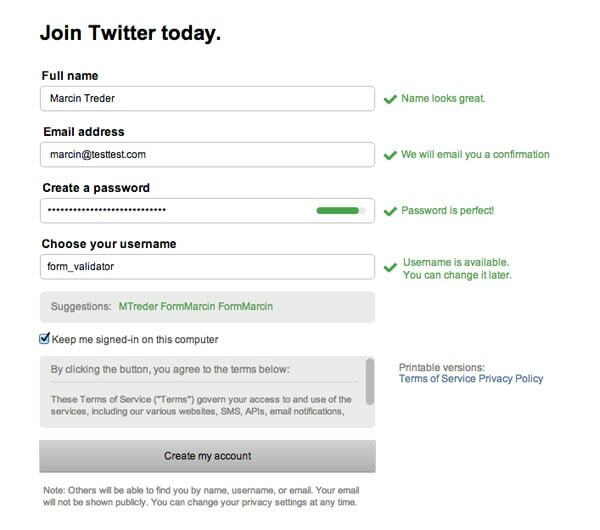 A couple of years ago I saw Twitter’s form validation for the first time and I was absolutely amazed. User Interface nerds among you probably know what I’m talking about. At the time we were almost jumping with excitement. 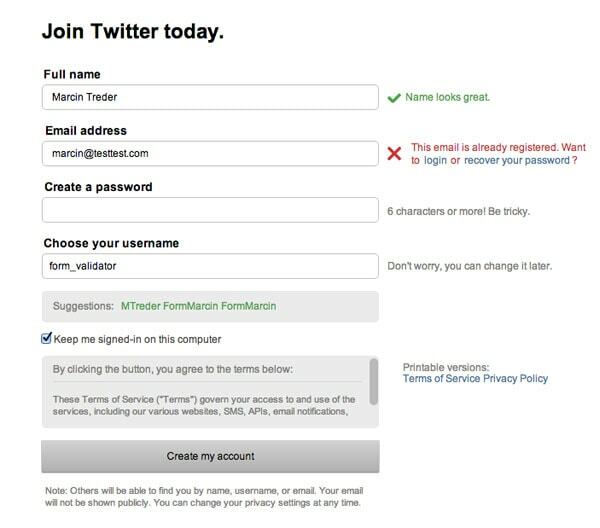 The discrete charm of well-designed form validation in Twitter’s forms was absolutely seductive. Informative error messages popped out right when I’d made an error, immediately eliminating irritation. “Inline validation” helped me understand what was going on right away. I could feel that this simple form was trying to have an actual conversation with me. That was a revelation! 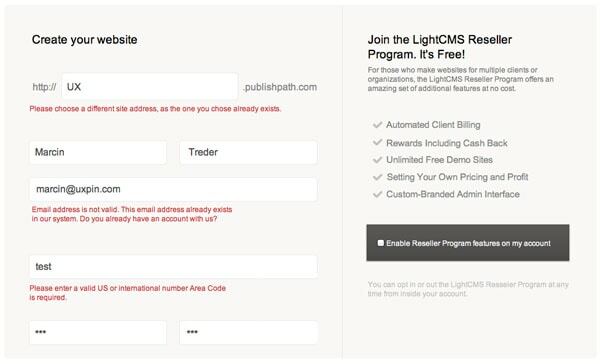 At the end, I didn’t have to wait for a reload of the whole page to check if the form was filled in with the right data. 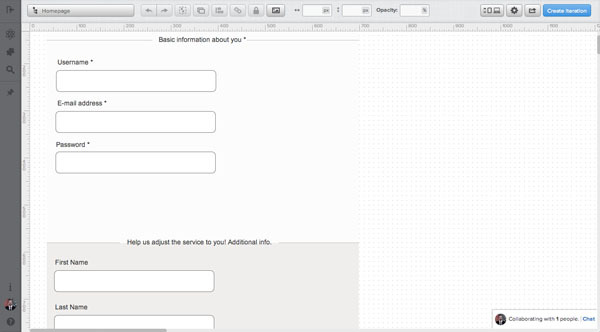 This experience completely changed my approach to the design of forms. It helped me understand that form validations are meant to have conversations with users and guide them through the difficult times of errors and uncertainty. The term “form validation” might need a little bit of clarification. Form validation is the technical process where a web-form checks if the information provided by a user is correct. The output of this process is emotional rather than technical. The form either points out that the user made an error, or assures that the provided data is accurate. To give you an example: if a user provides the data in a form field labeled “email address” the form should check if the provided text is in the right format (user@example.com) and if this e-mail address isn’t already registered. After submit validation – when the user provides all the data and submits the form, usually by hitting the button, the information is sent to the server and validated. The response of the “validator” is sent back to the user’s computer and it’s visualized as either a confirmation message (“everything went fine!”) or a set of error messages. Inline validation – validation messages are shown immediately after the user types in data to form fields. Usually, information is shown next to the fields and encourages the user to take immediate action. That’s a bunch of important moments in your interface life-span, right? The business side of your endeavor probably hangs on this. Let’s compare the online to the offline world. This always puts things into a familiar perspective. Let me make a simple analogy: form validation is the equivalent of having a conversation with a salesman right before a purchase – when everything is still on a knife’s edge. If the salesman is impolite and refuses to provide any assistance, you’ll certainly leave the shop without completing your purchase. If the salesman is professional, polite and helpful – you’ll reach for your wallet. Most form validations are as rude as the rudest salesman. Forms with error messages such as “Database error!”, “Wrong e-mail!” not only fail in terms of savoir-vivre – they usually result in a high drop-out rate. This shouldn’t be ignored. 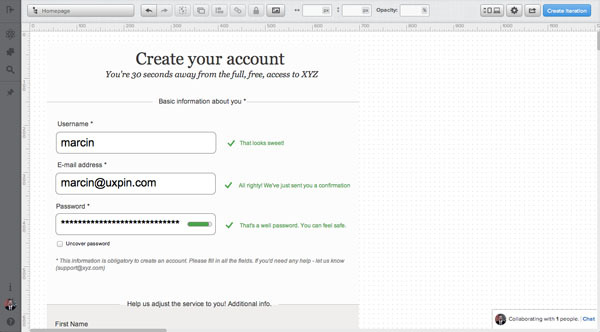 Designing form validation in the right way might have a huge impact on your business! And this is the point when we leave theory and jump into practice. Let’s see what the best players in the field designed and then we’ll learn how to step-by-step design perfect form validation. 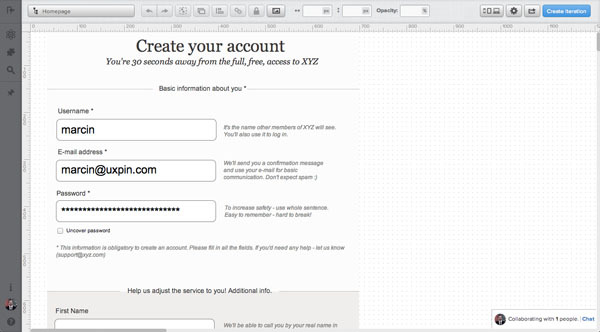 Each example used below can be uploaded directly to UXPin – The UX Design App as a reusable wireframe template. All these factors have one clear goal: to avoid confusion. Confusion is the arch-enemy of conversion. If you don’t want to risk a sky-rocketing drop-out rate, create validation that eliminates any risk of your customers being confused. That’s the road to a high conversion rate. As we could see in the example of Luke Wroblewski’s research – the right time to inform about the success/failure of provided data is right after the user has submitted the information. Inline form validation that immediately informs users about the correctness of provided data results in an increase in the conversion rate. Twitter is an obvious example here. They did a great job of avoiding user confusion. 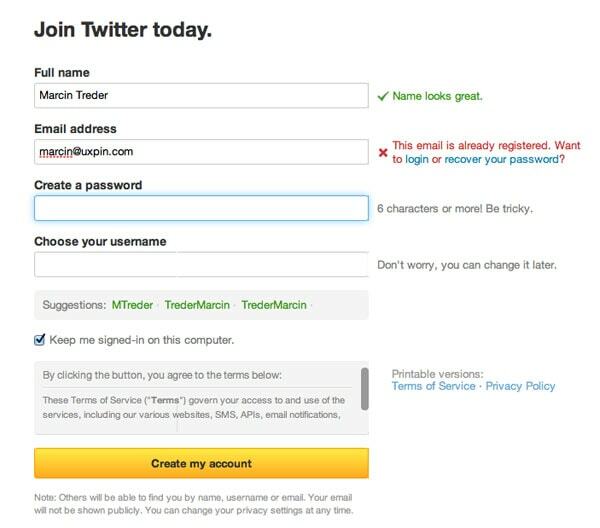 On the screen below you can see that I’m trying to register with an e-mail address that was already used. The form informs me that I should stop right at the second step and consider some back-up options, so I won’t be disappointed with the final result. A classic “after submit” validation would wait for me to fill in the whole form, reload the page and then it would let me know that something was wrong. Twitter chooses a better time to stop me – there’s no doubt about that. The immediate response of the form saves me a massive loss of time (yes, today even 3 minutes is a massive loss). And what’s even more amazing – Twitter is actually trying to have a conversation in this critical moment of our acquaintance. Thanks to inline validation, they can immediately offer me some options. Perhaps I’m the owner of the account registered with the e-mail and I just wanted to log in? Who knows – maybe I’ve just forgot the password? This is not only great form validation, which adds a lot to the conversion rate; it’s also a top-notch customer service. The place of the validation message is as important as the right time of showing it. On the discussed Twitter example – if the message wasn’t next to the field, but placed somewhere below, I wouldn’t manage to notice it quickly. If I didn’t notice it…well, that would just be confusing and dangerously close to forcing me to leave the form without finishing the process. When you’re wondering what place to choose for your validation messages, follow this rule of thumb – always place the message in the context of action. If you want to inform the user about an error occurring in a particular field – show it next to the field. If the error is general (e.g. a problem with sending data to the server) and there wasn’t a reload of the page – show the message next to the submit button, if there was a reload of the page – show it at the top of the page. Take a look at the example below. Light CMS shows error messages next to each field. That’s really easy to notice and understand. Etsy’s form is also a great example of well placed validation messages. In this case I also really like the construction of the form and the visualization of error messages. The clear division into sections (Sign Up Using Facebook, the main sign-up form) provides clear guidance through the sign-up process. Error messages have a lovely visualization – with a red border around form fields and red message boxes – the intention of the communication couldn’t be clearer. That’s a good attempt at eliminating confusion from the form. If the construction of the form doesn’t give you too much space for a clear error message, follow the example of Vimeo. Vimeo, using tooltips pointing at specific form fields with errors, avoids lots of confusion. The color-based correlation is also helpful. A red error message corresponds with a red background and red border of a field with errors. Error messages are placed in the context of action (in this case an error) and that’s the foundation of clear communication. Of course the problem here is the “after submit validation” which makes people wait till the validation of the form is done on the server. However, in the case of such a short form, I wouldn’t expect it to be a critical design error. Color – is easy as 1, 2, 3 – red is for errors, blue for information, yellow for warnings, green for the confirmation of success. This color system is the most intuitive you can imagine. At least part of it (red & yellow focus attention and raise blood pressure) is backed up by evolution and the whole system of color – meaning is present e.g. on the roads. Don’t confuse it and you’ll be ok.
On all the examples above we’ve seen this rule in action. Let’s review a couple more interesting solutions, so you’ll have plenty of inspiration. Again Twitter rules when it comes to proper form validation. Confirmation messages are extremely clear with the green color and the little “check” icons add to the overall greatness. Pay attention also to the password field. The green indicator inside the field shows how safe your password is. Now that’s a home run. Love it! 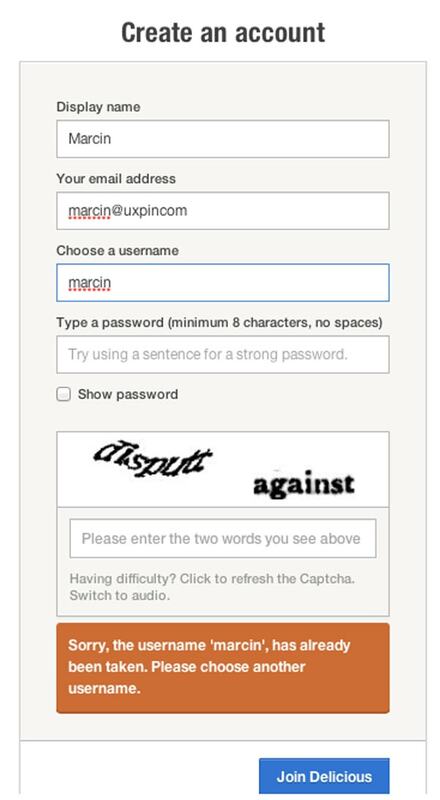 Pinterest is also an interesting example of the smart usage of color in validation messages. With a red box around the whole field, the danger of an error is emphasized. The addition of neatly done inline validation makes it a truly anti-confusion solution. Take also a close look at the construction of the form. Six fields are visually divided into two sections. One is all about logging in to the service and it’s somehow formal. The other is personal – First Name, Last Name and Gender. The division makes a lot of sense because your last name and gender aren’t obligatory. However, not indicating that some fields are obligatory and some aren’t, is on the verge of being a dark pattern. 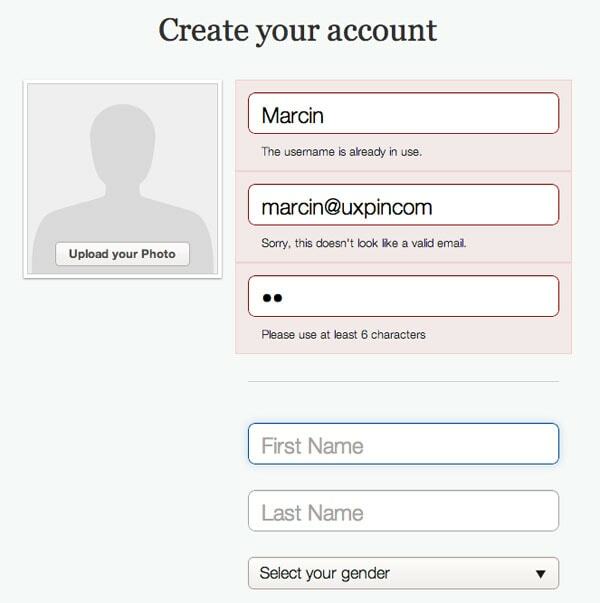 People might feel tricked into filling in their last name and gender (which might be used for advertisement targeting reasons). I can see their very efficient strategy of gaining data, but I would be very careful with such practices. 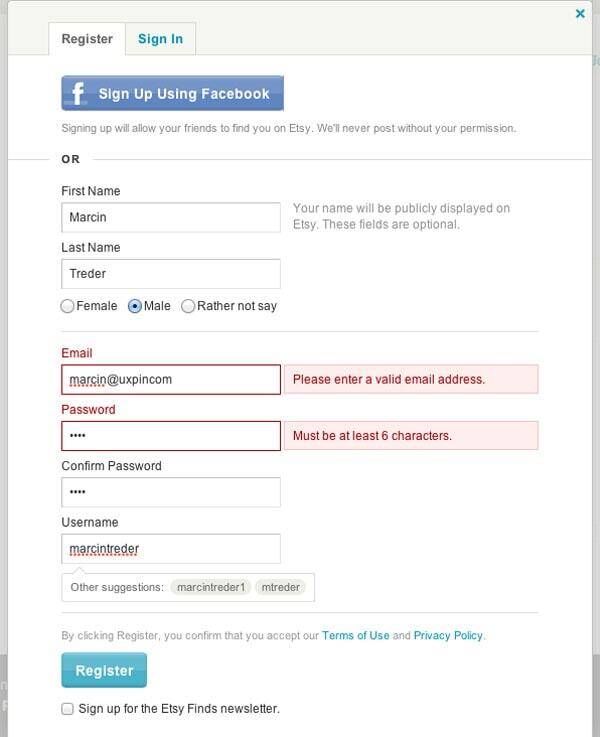 Usually, I recommend asking users for non-obligatory data after the sign-up process. Finally – language – that’s the tough one. I spent hours looking for examples worth mentioning and didn’t find anything that was perfect. And should always avoid using technical jargon. The rules are simple, but somehow they are very easy to ignore. A typical error might state that “the email is invalid” without telling the customer why it’s invalid (a typo? Is it occupied?). This brings confusion on board. A risky business. Of course, again, Twitter is an example of the usage of clear and crispy language. When they say that your e-mail address is OK, they use a confirmation message to say “we’ll e-mail you confirmation”. If the e-mail is already registered, they give you the option to log in, or recover your password. 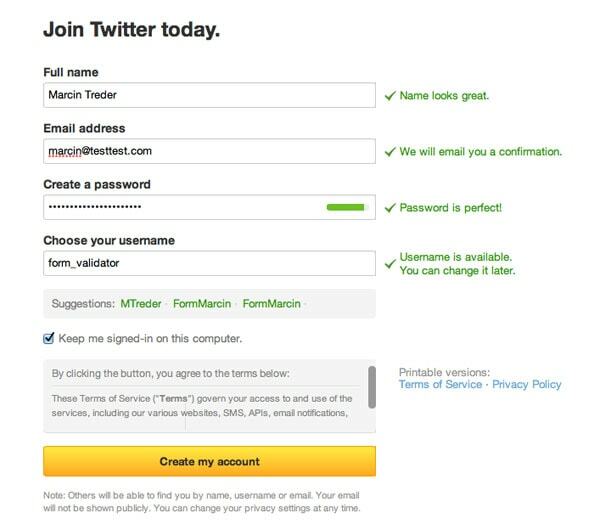 If you manage to create a perfectly safe password, Twitter will tell you “perfect password!”. Now isn’t that nice? It’s all about having an ordinary conversation. Delicious makes lots of mistakes in their form and its validation, but they handle the language side in an interesting way. First of all, and I absolutely love it, they added a little info to the password field “Try using a sentence for a strong password.” Isn’t that helpful? I’ve been waiting to see something like that for a long time. It makes a lot of sense when it comes to the safety of a password. 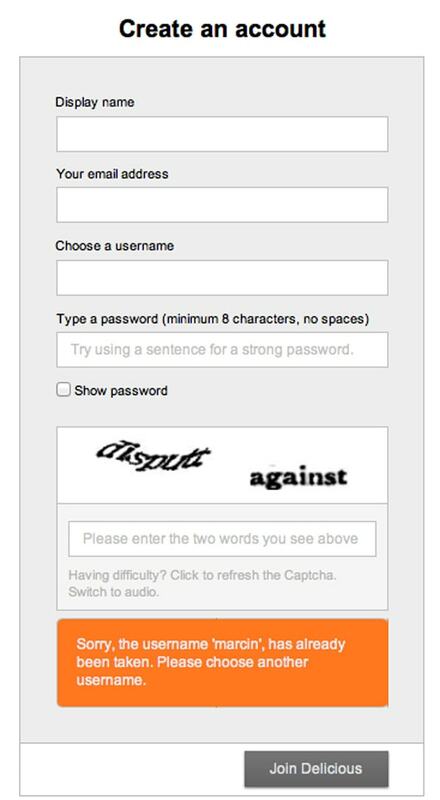 Much more than requiring people to type a capital letter and a number. 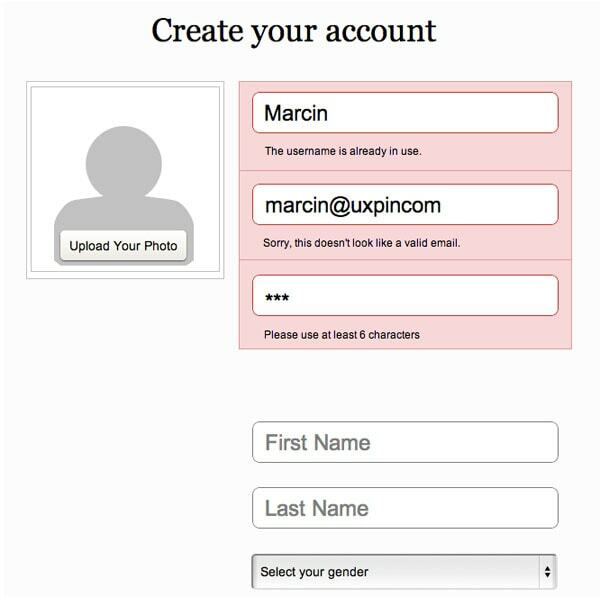 1) “Sorry, the username ‘marcin’, has already been taken” – clear information about what happened. However, they lack a back-up option. Perhaps I just forgot that I had an account? Anyway, Delicious broke the rules of right time, right place and color… but, thanks to the right language, their form is still rather usable. This is how important language is. Time for a step-by-step tutorial! 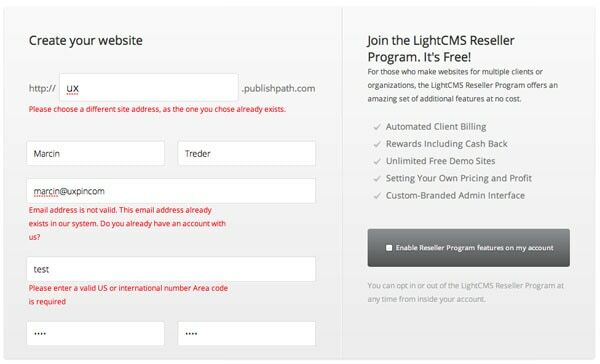 By following our 4 simple rules mentioned above, we’ll create perfect form validation. Form validation that will minimize the risk of losing a customer on the way to the ultimate goal of the service. Just to prove my point, I’ll design a form with a section of additional, non-obligatory, information. Something similar to Pinterest’s form. As I said, usually I wouldn’t recommend doing it that way, but if you really must, there’s a couple of things you can do to make it easier for people. I’ll start with the structure of the form and a header. The structure is really easy. The white part is devoted to obligatory fields, the gray part to non-obligatory, additional information. I’ll just draw simple boxes, to fix the space and give my design a structure. 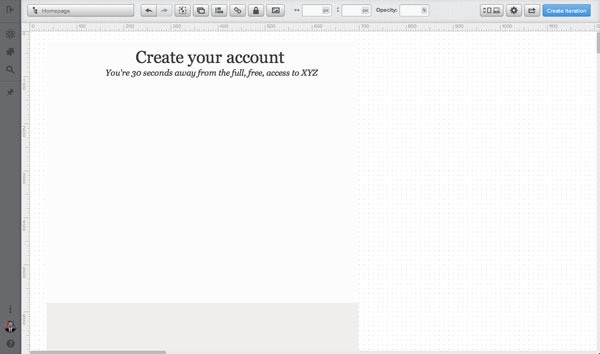 Then I’ll add a header – something very plain, putting persuasive information into the sub-headline. Again – I’m looking for an anti-confusion solution. In the next step, I’ll add form fields and labels. Since I’m strongly against labels inside the fields (very confusing, if you start to write something inside the field, stop for a couple of minutes and then want to start again… there’s no indicator of what you should write in the field), I’ll place them above the form fields. Additionally, I’ve added two sub-headers that explain what types of information need to be provided in each section. Form field information is something that’s often omitted, but in reality it’s very helpful as a start of the conversation with users. By using one or a maximum of two sentences, you can explain some risky things like “why do you need my e-mail?” and build basic trust. This additional information might not be critical, but it’s the starting point of a “relationship”. It’s better to say more, than to confuse users. When it comes to error messages, we need to really carefully consider all of our rules. The right time to show the message is right after the error is spotted. We’re going to design for inline validation. Clear non-technical language – no “database error” etc. Can you see the pattern in these error messages? I’m stating clearly that there was a problem and immediately I’m coming up with a solution. And finally – confirmation messages. These are a pure pleasure to design. Since they pop out right after typing text into the fields, I’ve decided to come up with a more subtle solution. I don’t want people to stop on the confirmation message. They should scan it quickly and go to another field feeling good about the previous step. No heavy colorful boxes, not long sentences – just a quick confirmation. And that’s it! Easy as 1, 2, 3. Form validation aligned with our four rules. It didn’t hurt, did it? 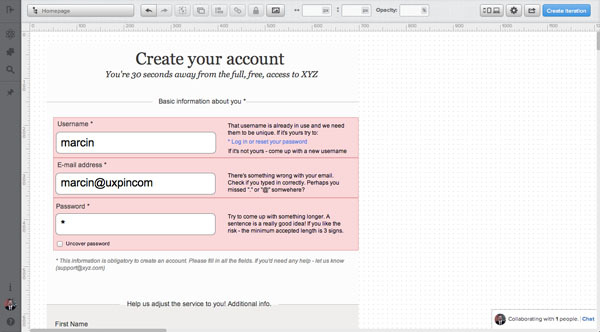 If you like the form – upload it to UXPin and use it in your designs for free. Awesome! I’m glad to see that I used some “good rules” with my forms and I’ll try to respect those now. Thanks! I like ‘Labels in Fields’. It is compact and looks cool. I’ve used it in my latest project. Just remember to repopulate the field if the user deletes the inner text. In case he forgets what the field is about. Great article – as I’ve been optimising forms for a few years now and find it rewarding (both for user experience and revenue). I read and listened to Luke W voraciously and still do – his work here inspired me to squeeze every drop of misery and revenue out. I have a couple of examples to show you on slideshare, of field level validation. These I have tested out and they make lots of money. This is a good one – by understanding the algorithm that the British Royal Mail uses, you can auto correct the most common errors people make. For example, the postcode CR0 1LH can be entered a number of ways. The visitor might change the zero (0) to a letter O and the 1’s and L’s frequently get swapped. People also shift the characters – it’s common to write the postcode in capitals (for those who remember writing letters lol). So many people are less expert typists than us tech types and look at the keyboard and not the screen. They don’t use caps lock and shift the characters. In the example above, the input becomes CR)!LH – WTF? There are quite a few patterns like this with phone numbers, fields, dropdowns – where you can optimise at an atomic level. Auto cleaning the postcodes for the example above (and not generating any error message) was accomplished by working out *what they actually meant* using the rules of the royal mail. CR) !LH – really only can be the postcode we are looking for. For total failure or garbage, the form just degraded to let you fill in your address by hand. So there were options for everyone, even those who mistyped it – but that part is completely invisible – we just filter it on submission. This sort of field level tuning netted out 2.5% higher conversion for the entire funnel. Keep up the great stuff – been enjoying the articles. Good article indeed. Well written and points are good. I’ve done a lot of research into forms field design by reading numerous books and articles written by reputable designers and UX designers. …I wish you’d come tell that to my boss and/or marketing department! Nice, detailed article. I’d make two comments. Firstly, your error messaging could be improved — and importantly, made more accessible — by including some sort of icon to indicate errors (e.g. an exclamation mark). That way you’re not dependent on colour as a way of perceiving errors, useful for people who have colour-deficient vision (between 4% and 10% of the general population). Secondly, I would point out that while inline validation can work beautifully for short, straightforward forms — as you’ve shown here — designers and developers should think twice before using it on longer or more complex forms. For such situations, inline validation is entirely untested. 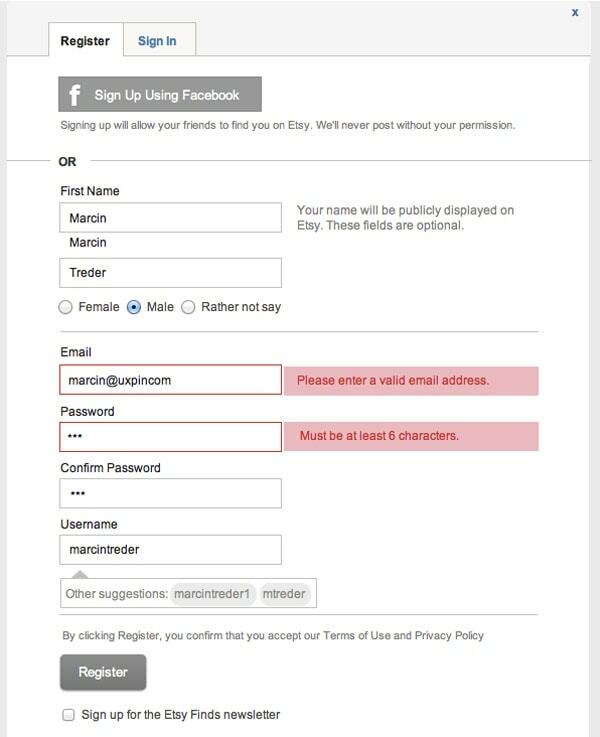 Based on my experience working with forms for the past 17 years, I would be concerned that when the form is not as simple, inline validation might feel too much like interruption of a broader flow. This, in turn, might actually lead to a decrease in completion/conversion rates. Moreover, all of the fields in a longer/more complex form are unlikely to be able to be validated inline. So some “upon-submit” validation is likely to be needed. This raises the question of whether it is better to be consistent and just do “upon-submit” validation, or whether it is OK to mix the two. With the latter, I would worry that users would think a field not triggering inline validation has been answered acceptably, where it might just not be able to be validated inline. If you have any research on this, would be very glad to hear of it. Otherwise, thanks for the detailed how-to, which I know will help many people. Oops! I said “Hi Ryan” when I meant “Hi Marcin”. Apologies! It would be worth considering tracking some of the error messages. If you use GA and track them as ‘virtual pageviews’, GA will even calculate count the ‘exits’ and calculate the ‘exit rate’ so you can see how many people leave the site after seeing that message. The relative impact of errors from the various fields can help you understand where the real pain points are. That’s a neat idea but surely it assumes that people will exit completely, in order to see this metric. There is another one to measure – which is the impact on form conversion without errors, form conversion with errors (and split by common groupings) – as this means that people who browse around and return are also considered in measuring the impact of errors. Another question – why not just use event tracking for the whole lot? I completely agree that you definitely need to look at the impact of the errors in a wider context. In fact the exit rate proves the point: they tend to vary over quite a range, but 10% would be high for a single field. So most people *don’t* exit straight after any individual error and you need to analyse the bigger picture. But the exit rate is useful as a proxy for bigger impact comparisons (maybe). And “we lose at least n hundred orders per week over this one mandatory field, worth $nnnn per year + the cost of the wider impact” is useful for getting things fixed. Re events v page views: events seem best conceptually. And you could even give them a value in theory. But you need virtual pageviews if they are to show up as abandons in traditional funnel visualization (I live in hope of improvements there). And you need pageviews for the exit rate. But it’s not an easy choice. Agree with you and good point about the funnel visualisation. I guess exit rate is a proxy but much depends on how representative that metric is of what combinations happen. A lot of analysis I’ve done found clusters (or single) error messages – that were precursors to abandonment. If getting an exit rate for a field helps you track things down, that’s great. Just that sometimes it’s more about the pattern and flow of error messages. For example, you submit once, the form generates an error and you submit again but the form had wiped one field value. You now get the second error and have to correct that. I saw a lot of clustered validation messages that drove exits and also resubmits always cropped up. If the impact of a single error is strong enough and common enough (inside some of the clusters) then using the exit rate will work fine. If the exit is down to multiple repeat errors or varied clusters – then it’s useful but less so.